France : Steve Mandanda (G, Marseille, RD Congo), Patrice Evra (D, Juventus Turin, Sénégal), Eliaquim Mangala (D, Manchester City, RD Congo), Adil Rami (D, FC Séville, Maroc), Bacary Sagna (D, Manchester City, Sénégal), Samuel Umtiti (D, Lyon, Cameroun), Ngolo Kanté (M, Leicester City, Mali), Blaise Matuidi (M, PSG, Angola), Paul Pogba (M, Juventus Turin, Guinée), Moussa Sissoko (M, Newcastle, Mali). 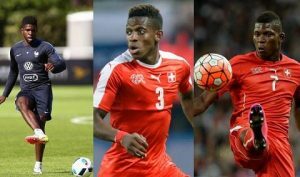 Switzerland : Johan Djourou (D, Hambourg, Côte d’Ivoire), François Moubandje (D, Toulouse, Cameroun), Gelson Fernandes (M, Rennes, Cap-Vert), Denis Zakaria (M, Young Boys Berne, RD Congo), Breel Embolo (A, FC Bâle, Cameroun). England : Ryan Bertrand (D-M, Southampton, Egypt), Dele Alli (M, Tottenham, Nigeria). Pays de Galles : Hal Robson-Kanu (A, Reading, Nigeria). Germany : Jerome Boateng (D, Bayern Munich, Ghana), Jonathan Tah (D, Bayer Leverkusen, Côte d’Ivoire), Sami Khedira (M, Juventus Turin, Tunisie), Leroy Sané (A, Schalke 04, Sénégal). Czech : Theodor Gebre Selassie (D, Werder Brême, Ethiopie). Belgium : Christian Kabasele (D, Genk, RD Congo), Jordan Lukaku (D, Ostende, RD Congo), Moussa Dembele (M, Tottenham, Mali), Marouane Fellaini (M, Manchester United, Maroc), Michy Batshuayi (A, Marseille, RD Congo), Christian Benteke (A, Liverpool, RD Congo), Romelu Lukaku (A, Everton, RD Congo), Divock Origi (A, Liverpool, Kenya). Italy: Angelo Ogbonna (D, West Ham, Nigeria), Stephan El Shaarawy (A, AS Rome, Egypte). Portugal : Eliseu (D, Benfica Lisbonne, Cap-Vert), William Carvalho (M, Sporting Portugal, Angola), Joao Mario (M, Sporting Portugal, Cap-Vert), Renato Sanches (M, Bayern Munich, Cap-Vert), Eder (A, Lille, Guinée Bissau), Nani (A, Fenerbahçe, Cap-Vert). Austria: David Alaba (D, Bayern Munich, Nigeria).